This is the least commercial, most benevolent, best access to the real Namibia, with superb guiding, animal tracking and local know-how. Let Boas and the others guide you with good humor and exquisite patience through the bush to a waiting Rhino, or back up in perfect viewing of an elephant cow cooling off with her calf by spraying herself with her own saliva, or sit on the veranda in their elegant and tasteful stone lodge at Etaambura, from which you sojourn virtually alone with the Himba tribesmen, who greet your guides as that rarest of things in Africa, honest allies accepted and revered by the locals because they reciprocate the respect. Give CSN some time. You will never forget it. A fantastic and fascinating experience! We were picked up at our lodge in Swakopmund by Garth, Sonia and Nico, our team for this expedition. From there we drove north in our Land Rover Defender with the trailer behind. On our way we stopped and looked at shipwrecks on the Skeleton Coast and thousands of seals living in big colonies. Fascinating! Reaching the place were we should camp for the night we were met by our first big surprise; 2 elephants fighting for fun at the spot were we should make our camp. A fantastic experience. Garth with his unique experience with these animals made us just relax and enjoy. The camp was set about 50m away from the elephants. The sun set and we had a sundowner on a hilltop enjoying the fantastic Namibian sunset. As the days passed we learned how important the work of the conservancy is for the animals, the environment, the people, the culture and how big the need is for this engagement. It is also good to know that the money we spend here goes directly to the conservancies. We have experienced fantastic nature, seen lots of animals, elephants only a few meters away from us, met a lot of friendly and accommodating people. We were lucky to participate at a Himba funeral celebration, thanks to the close relationship Margaret and Garth have to these people. To travel together with them also means that we come close to the people and the culture. It has been a fantastic journey and great thanks to Sonia who looked after us in the best way possible and to Nico who made everything go smoothly. We have already booked a new expedition in August 2015! 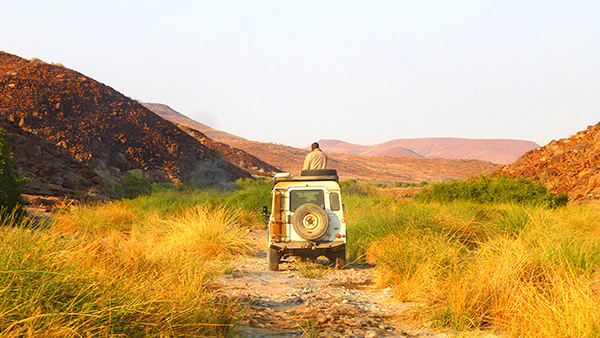 If you want to visit Namibia (and you should), there can be no better way to experience the 'real' country than with Conservancy Safaris. Six of us were impeccably well looked after by Garth, Boas, Kaku and Nico. We travelled great distances, but were never bored, and had frequent pit-stops. The arid countryside changes constantly, the flow of information and knowledge was fascinating, the variety of flora and fauna was extraordinary. Each campsite was significantly different, and ranged between wild and deserted to manicured and almost European. We were astonishingly well fed and watered (well, actually a bit more than just water), particularly bearing in mind some slightly tricky conditions. We always felt safe. It is hard for a European visitor to imagine, or even describe the beauty of the Arid Eden we got to know a bit, thanks in particular to Garth and Boas's love for and knowledge of the Kaokoveld, historical, geographical, geological, in addition to anthropological and zoological. Perhaps an indication is that our two terrific and un-missable days at Etosha at the end of our trip seemed rather tame after the expedition/experience we had over the previous 12 days and nights. One warning: don't expect an exact itinerary! When you can't cross a flooding river (and bridges are a rarity), you have to find somewhere else to go. But you can trust the experience of CSN to find a very suitable alternative. It just makes a trip a little less predictable, and a little more exciting. Thanks for the 100% perfect memories of Namibia! 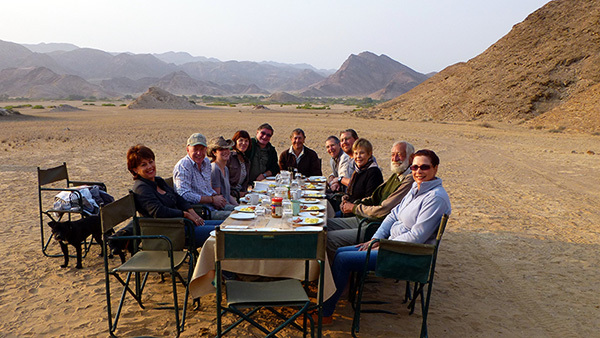 In May 2013 four of us Canadians joined Russell and Garth on a nine day safari to Etosha and Koakoland in the Kunene Region. We all really had a wonderful time with Conservancy Safaris. We stayed at both excellent lodges and camps and greatly enjoyed both experiences. The camps were in the most incredible areas, each with its own beauty. We were really well looked after by Boas and Sonia who set up each camp and provided the most excellent meals. What Sonia achieved on an open fire put us all to shame what we struggle to do in a fully equipped kitchen! After a long day to arrive at the camp and have everything ready for us was wonderful and greatly appreciated. Meeting Flip was very special; this man is awesome (not a word I normally use), his dedication and capacity for working under extraordinary conditions is incredible. We feel it was a great honour to be allowed to observe him at work and enlightening to talk to him; thank you for arranging it. This is work we will follow on the website. What an amazing trip! Space, very varied and quite spectacular scenery, good birding, a fascinating culture and a far-sighted conservancy programme. Very many thanks to all of you - Angela in the office, Russell and Boas (our two nomadic human encyclopedias), Sonya (our ever-smiling chef/house-keeper extraordinaire) and Kaku (we wish her well at Etaambura). Etambura lodge is a great place in a fantastic location with breathtaking views and a fabulous architectural design. 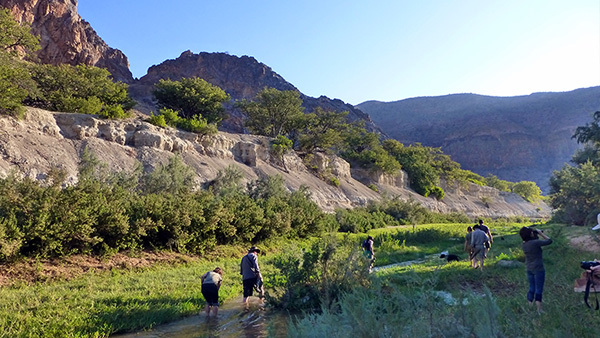 Landscape in Kunene was very impressive and seeing game in that set-up was brilliant. Particularly loved the rhino tracking. Also, getting insights into how the local communities live and conservancies work was very informative and interesting. Catered camping was excellently organised and very comfortable. Staff was brilliant. 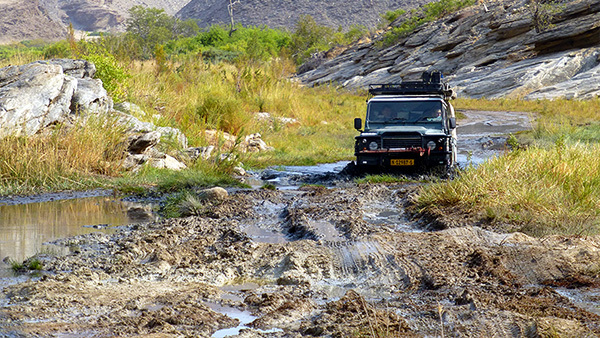 Due to long distances and poor roads a lot of time is spend in the car - don't know whether it would be possible to minimize this by replacing some of the game viewing by car with walks? I can’t tell you how much we appreciate your guiding hand in our African sojourn. Everything you said was spot on. The mixture of campsites and lodges was just right. 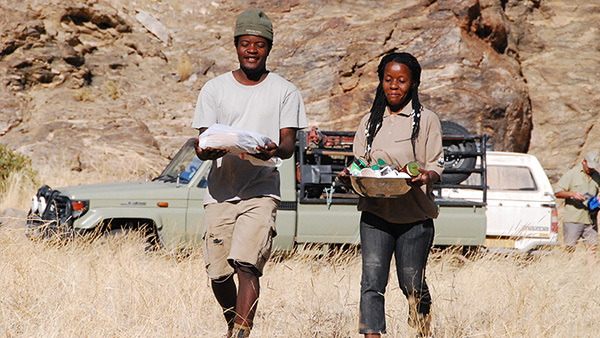 I think the Kunene Conservancy Safari with Russell, Felix and Kaku was the highlight of the trip. Thanks so much for putting that in. It seems we were in Namibia and Botswana at a pretty extraordinary time. We didn’t actually experience a lot of rain but the effects of earlier rains were quite evident. We had been hearing that game viewing was more difficult because of a longer rainy season. Not knowing any different we were excited with our game viewings at Sesriem and Brandberg Mountain though. When we met up with Russell somewhat later the true scope of what was happening was revealed. His enthusiasm concerning the lush growth on a desert landscape was infectious. 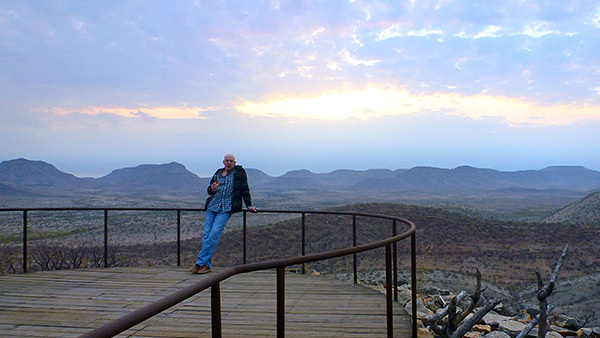 Just looking out over Damaraland, a place we had never seen, became the African experience we had hoped to find.